Sensitive to skin. 0% Aluminium Chlorohydrate, 0% ethyl alcohol, 0% parabens. Dermatologically tested. 24-hour effective odour protection. Experience healthy sensitive skin with dermatologically tested deodorant. 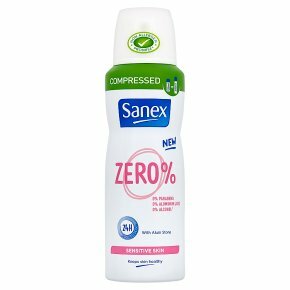 New Sanex Zero% Sensitive Skin Compressed Deodorant* with Alum Stone offers 24-hour odour protection without Aluminum Chlorohydrate, parabens or alcohol. Let your sensitive underarms breathe. *Lasts as long as Sanex 250ml deodorant. CAUTION: Extremely flammable aerosol. Pressurised container: May burst if heated. Keep out reach of children. Keep away from heat, hot surfaces, sparks, open flames and other ignition sources. No smoking. Do not spray on an open flame or other ignition source. Do not pierce or burn, even after use. Protect from sunlight. Do not expose to temperatures exceeding 50°C/ 122°F.